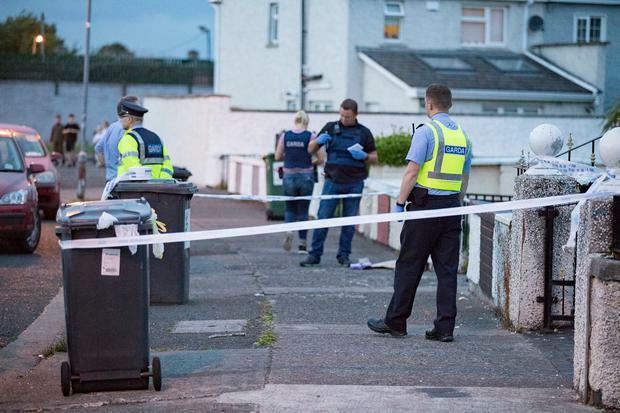 A 63-year-old man has died after a vicious stabbing at a house in south Dublin. Gardai have launched a murder investigation into the incident on Rutland Grove, Crumlin, which happened at 8pm last night. The man was stabbed at his home by a lone male, before the suspect fled in a stolen car. Gardai were alerted to the scene and a manhunt was launched across Dublin 12 and the south-inner city area. The suspect was later arrested in the Blanchardstown area of west Dublin. The scene remained sealed-off at Rutland Grove last night pending a technical examination. The victim was brought to St James's Hospital where he was later pronounced dead. The exact motive behind the killing has not yet been established, but it is understood that the victim was known to the chief suspect. Around a dozen gardai, including detectives, were at the scene last night. A number of shocked locals were also seen being comforted by friends following the horrific incident. A source last night said that the suspect had been "on a rampage" over the recent days leading up to the killing. "He was arrested on suspicion of drug driving the day before this stabbing, and was in a very bad state," the source said. "Unfortunately there was nothing gardai could charge him with that would constitute an offence to oppose bail. "This is still a live and active investigation. "The exact circumstances in which this stabbing took place have yet to be fully established." The incident is under investigation by detectives at Sundrive Road Garda Station. Sources said that the victim suffered an arterial bleed after being slashed in the neck.